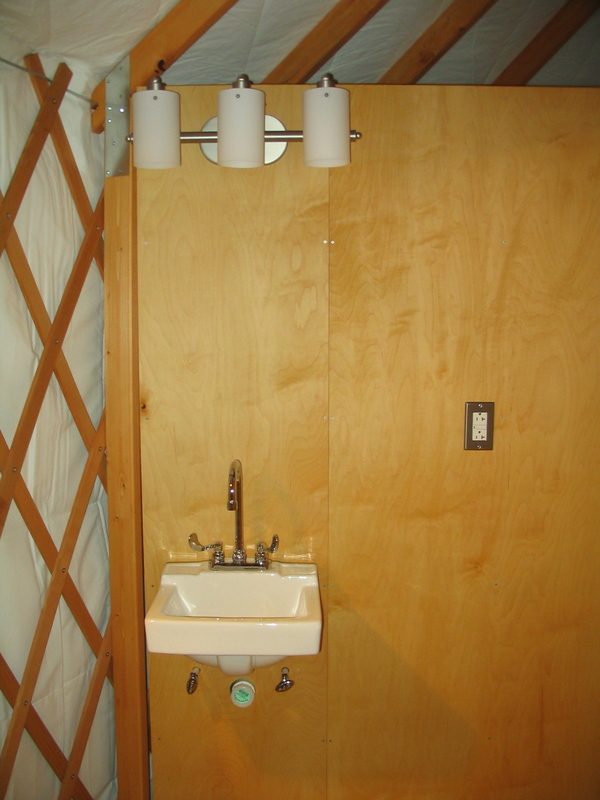 Last weekend Gavin hung and plumbed the bathroom sink. I’m not sure you can tell from this picture, but the sink is really tiny. Which is why we got it: to fit in the tiny yurt. But the faucet I picked out overhangs the sink by quite a bit, which may be annoying. We may have to change it out to a smaller faucet if this is a problem. We’ll see once we start using it. We had the lumber for the decks delivered. 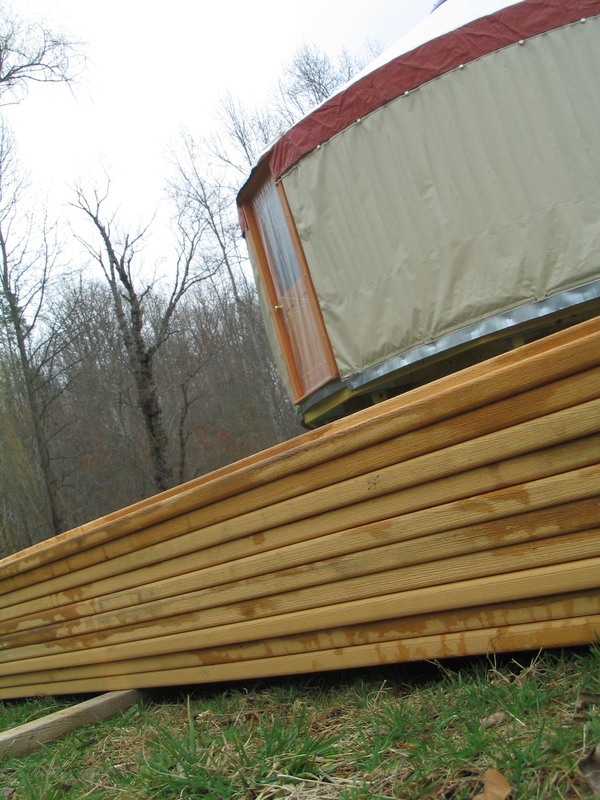 We are building two covered 8’x8′ porches on the north and south sides of the yurt. 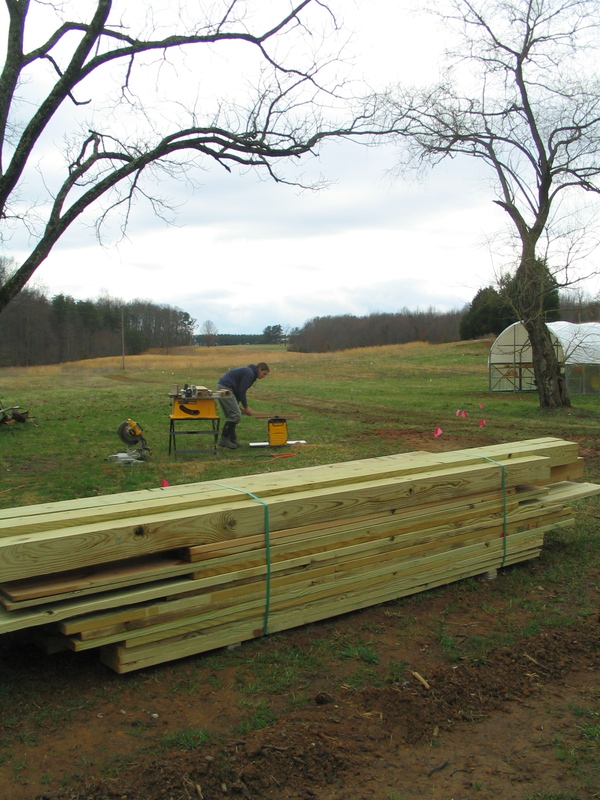 In the background you can see Gavin planing boards for the base kitchen cabinet. Gavin got the decking boards from the Habitat For Humanity Re-Store in Lynchburg. They carry a lot of surplus building materials that contractors donate to them plus used odds and ends that homeowners bring in. We took a few things there ourselves when we were remodeling our Lynchburg house. It is hard to throw something away when you know someone might have a use for it. Anyway, the boards are a composite decking material, like Trex. We used this for our deck in Lynchburg and loved it. It’s nice to walk around on barefoot without worrying about getting splinters. Although they didn’t have enough boards in the gray color we wanted, it was worth a compromise for half the price of retail. I was trying to picture what that sandy color for the decking is going to look like against the yurt. Not too bad. It matches our soil anyway. The truth is, after a while we won’t even notice it. We got the bathroom sink from Habitat too. It was $5. You can’t beat that. In other farm news, I ordered 32 varieties of dahlia tubers. I have recently become intrigued with this flower. We will try growing it this year and if it does well we will propagate it next spring and sell the cut flowers. The tubers will arrive in mid-April, and hopefully by that time we’ll be staying at the farm regularly so I’ll be able to tend them. I still haven’t placed a seed order, through I’ve been reading the catalogs quite a bit. It seems more important to be focusing on getting there first. The time will come.